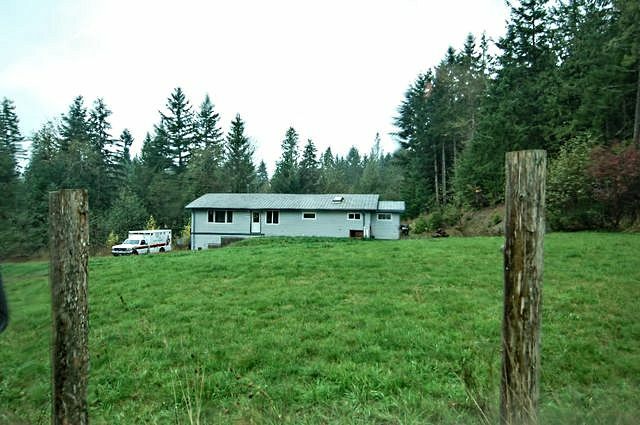 AFFORDABLE AND USEABLE 4 ACRE PARCEL with a newer 1 bedroom mortgage helper suite downstairs. With a little elbow grease this home and acreage could be a great place to call home! With over 2600 square feet of living space, the upstairs offers an open living design along with 3 bedrooms and 2 bathrooms. Down is currently the 1 bedroom suite(could be 2 bedrooms)along with plenty of storage/space. Each floor has it's own laundry room, there is a 200 amp service, and the suite has a separate entrance so it could easily be fully self contained. To help with chilly nights there is a wood burning forced air furnace downstairs along with a woodstove upstairs. Property features include a spring fed year round pond with seasonal creek, an area suitable for a shop or barn with power easily accessible, a mixture of treed and cleared areas, and a well producing 5 gpm. Located only 10 minutes from Duncan with school bus and public transit almost at your doorstep. Text message or call me for a viewing or more info. If long distance, call collect. I'll be happy to hear from you, 250.701.1215 Mike Eddy www.MikeEddyForYou.com "It's All About You!" Thanks for your business.